This week's soup stars lentils and spices for a hearty bean and vegetable soup. Although this version is basically vegetarian, ground beef, turkey or sausage would be a wonderful addition for the meat lovers in your family. This is originally from Grit Magazine. I tinkered around with it to make it suit my tastes. 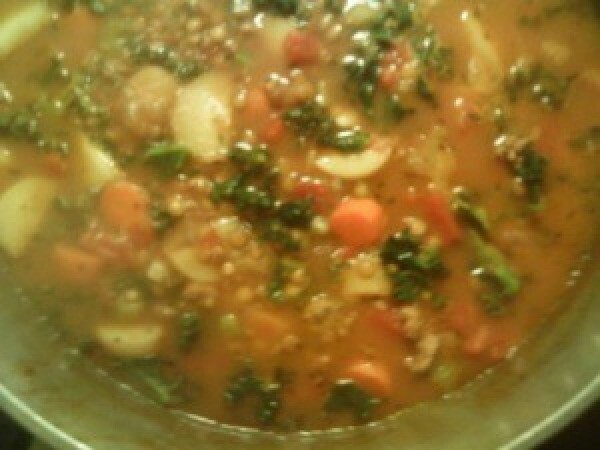 It is my favorite lentil soup, hearty, full of vegetables, and exotic spices. Lentils taste real good, are very nutritious, and cook up quickly. People have been eating them for a long time - they are referred to in the Bible as "pottage". Heat a large soup pot. Add the olive oil, onion, and celery, and saute for about 5 minutes. Add the coriander, cumin, and garlic and saute 3 minutes. (sauteing will bring the flavor of the coriander and cumin out) Add the carrots, parsnips and turkey (ground lamb is good too) and saute a few minutes, then the rest of the ingredients, except for the cilantro. I take the kale off the rib, but I don't throw the ribs away - I slice them up, throw them in the pot, and they get nice and tender. Add salt and pepper to taste. Bring to a boil, then reduce to a brisk simmer. Skim any foam. Cook with the lid on to keep it from getting too dry for about 40, 45 minutes, until the lentils and vegetables are tender. Just before serving, stir in the cilantro. Garnishing with fresh mint is very good. Serve with rice, cous cous or quinoa. Source: Originally from Grit Magazine. This looks great! I love all the spices. Will have to make this soon while it is still cold outside. Thanks for sharing this! What a wonderful surprise to see your recipe and photo! I was really wanting to make a lentil stoup today. I have most of the ingredients and will play with it as need be, but it looks delish! I can't wait, esp being in PR and having so much fried food, I'm longing for a dish full of lentils and veggies. Thanks for the inspiration!